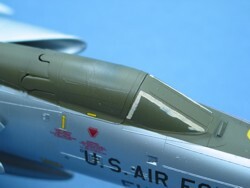 I have read many reviews where the author discusses brief details about masking the cockpit areas in preparation to painting the camouflage colors on a model. 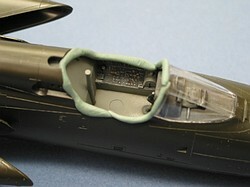 In most cases, the description revolves around stuffing something (like wet or dry tissue paper) into the cockpit to protect it. 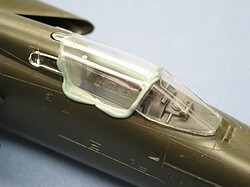 Some authors also mention using tape, applied around the cockpit edges to protect the cockpit. While both these methods do their job (keeping paint out of the cockpit), neither one addresses painting the canopy glass. In the case of a camouflaged aircraft, the demarcation lines between colors can fall right across the canopy. Getting the lines to match up when the canopy is painted at a later time can be difficult. Also, the "feel" of the paint on the canopies can be different if they are not painted at the same time as the rest of the model. I my opinion, nothing covers the cockpit areas better than the kit's canopy. After all, it was molded to do exactly what the real canopy does -- seal the cockpit from the outside. 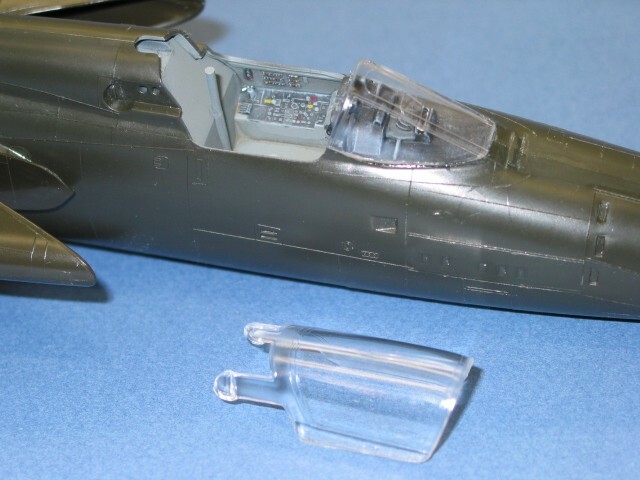 The following steps outline the typical approach I use for cockpit and canopy work. First, I complete the cockpit painting and assemble the fuselage. I then complete whatever upper cockpit areas need attention (like the top of the instrument hood). 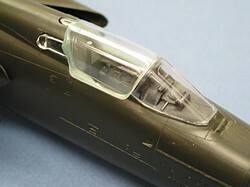 Following the completion of the upper cockpit areas, I permenantly attach the non-moving portions of the cockpit glass (like the windscreen). 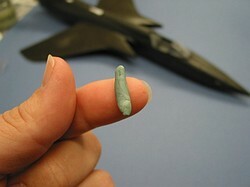 On a two-seat aircraft, this may also include a center section (like on an F-4 Phantom). 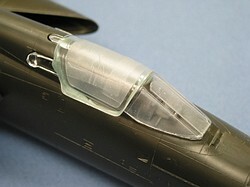 I do these attachments with a small bead of white glue applied around the edges of the glass. Then I press the glass into place. After the white glue dries, I use a wet Q-tip to remove any excess glue that squished out during the process to attach the glass. 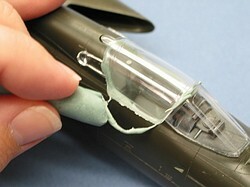 After another short drying period, I then apply a thin bead of super glue around the glass. The white glue acts as a gasket to keep the super glue fumes from getting inside the glass and making any fogging that I can't reach. I keep the super glue bead very fine as I only want to stengthen the already present white glue joint. 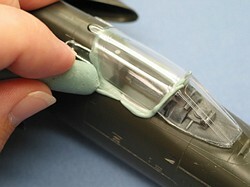 Generally, no sanding is needed to finish the super glue joint as it mostly dries to nothing. Any fogging on the outside of the glass can usually be scraped off with a plastic blade without marring the glass. Next, I "temporarily attach" the moving portions of the glass (the actual canopy). The key to this process is a substance called Fun-Tak. This is a blue putty-like substance sold by DAP for hanging posters on the wall and other such purposes. 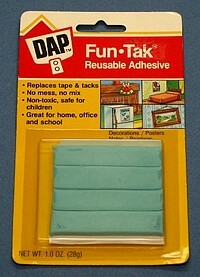 I bought my Fun-Tak at a Five-and-Dime store in the stationary department. It cost $1.29 for a pack, but that was many years ago. Many various things can do the required work for cockpit masking purposes, but I have found that Fun-Tak is the best. It leaves no oily residue, it is very plyable, and it never dries out. The wad I have been using has been open and just stuck on the side of my paint booth for the last fifteen or so years. I take a small amount of Fun-Tak and roll it between my figures to make a long spaghetti piece. I put the spaghetti piece around the cockpit edges as shown. Then, I squash the canopy down into the Fun-Tak. If the canopy has separate framing pieces, I assemble the canopy so that it is complete. In my example pictures (of a Monogram THUD), the canopy is one-piece with no extra framing pieces. I take a second piece of Fun-Tak and use it to remove the excess Fun-Tak that squished out when pushing the canopy into place. Gently rub the Fun-Tak back and forth along the canopy edge until all the excess Fun-Tak is removed. With the canopy full seated over the cockpit, I mask the clear portions using Parafilm-M. I'm in love with this stuff. It is the only thing I use any more for masking canopies. It is important that I have not applied the Parafilm before removing the excess Fun-Tak. Fun-Tak sticks extremely well to Parafilm. If I had masked the clear parts first, the process of removing the excess Fun-Tak would also remove the Parafilm. I will leave the canopy on the model in this state through painting, gloss coating, decaling, flat coating, and weathering. 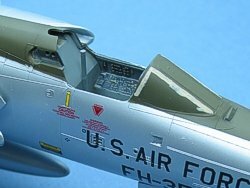 Only after the model is fully weathered will I remove the "loose mounted" canopy pieces and finish the painting of the cockpit sills and inside canopy. 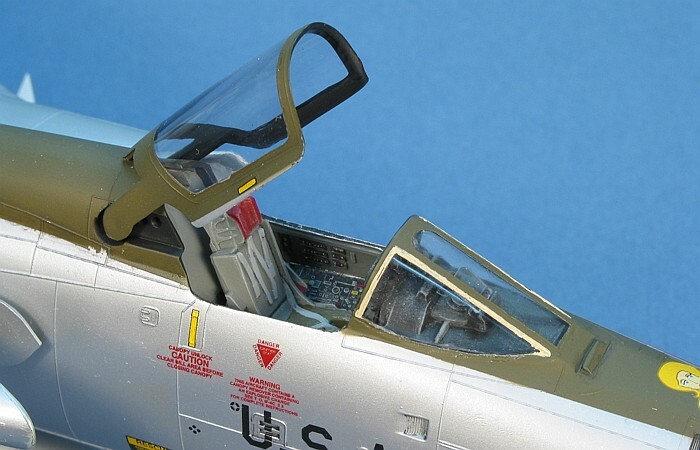 This way, the paint on the outer canopy is guarenteed to be a match to the rest of the model because it was present for all the painting and weathering. Here you see the canopy after painting, decaling, and weathering. It is ready to come off so the cockpit sills can be completed. There you have it. To remove the Parafilm from the canopy, I use a strip of Evergreen styrene (.080 by .100 inches). I file the end of the strip into a chisel point and scrape off the Parafilm. 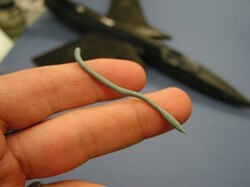 With the Evergreen styrene being rather soft, It does not damage the canopy and usually not the painted finish either.